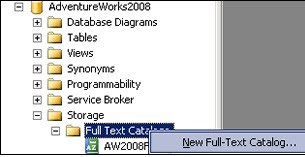 SQL Server provides a way using “Full Text Search” to search in a more sophisticated way ahead then normal exact character search. You can search by meaning (run, ran, running), by any order (Nisarg Kinariwala, Kinariwala Nisarg). Also you can search in multiple columns in a single shot. 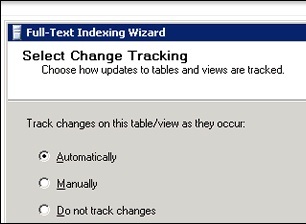 - Change Tracking Option has “Auto” and “Manual” options. When it is “Manual”, we have to populate the data periodically. “Auto” will take care as and when data changes in a column. This will identify all the rows where ColumnName contains “run”/”ran”/”running” etc. This will identify all the rows where all columns (participating in index) contains “run”/”ran”/”running” etc.